Conferences, Expos, and fairs! Oh my! We had you pegged as Wizard of Oz fans, and now we know it’s true. Ok, down to business. There are hundreds of game-related expos and conferences happening all over the world. Where do you even start? Luckily, a lot of these conferences are niched. Usually, the title of the conference will tell you exactly what to expect. This is good, because you don’t want to waste your time going to events that you won’t benefit from. 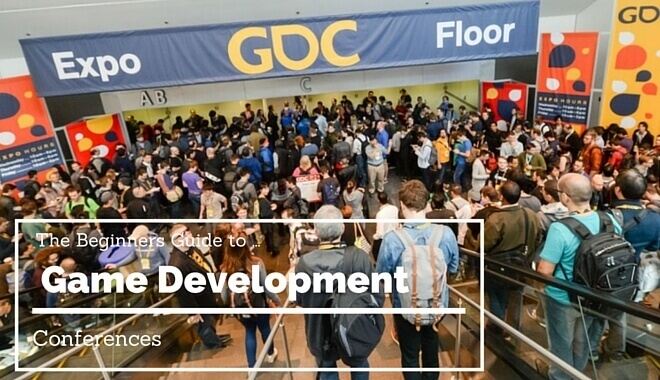 Through this article-guide hybrid, we’ll review the king of game development conferences, and give you an idea of how to find other conferences and events from which you could pull some real value. Related Content: Learn video game development and promotion. There is one mecha-conference for game developers. This conference is called…brace yourself…the Game Developers Conference. Impressive title, yes? It just had its 30th run in San Francisco in March of 2016. The GDC holds annual international events too. Historically there is one held in Europe and one in China as well. This event has been going on for a long time, so the showrunners have years of experience running the conference; they haven’t wasted it. There are learning opportunities, exhibitions, independent game competitions, and award ceremonies. Pretty much anything you would want at a conference like this is there. The beginning of the conference usually has several all-day workshops. Registered participants spend a day entrenched in these in-depth tutorials. These teaching opportunities usually span a wide range of topics, covering everything from game design (who saw that coming?) to business management. In addition to the hands-on offerings, the GDC hosts summits as well. These expert panels also run the gambit of game industry topics. There have been summits focused on game design education, which are good for aspiring students and faculty alike. The educational summit this year (2016) focused on the teaching aspect. It provided those who attended with “new experimental and inventive educational approaches” to game design education, according to the GDC website. There are other summits too, for game developers operating outside of the education sphere. The AI summit, for example, featured some top names in AI programming. The Free 2 Play summit discussed the recent explosion in popularity of the F2P model, and discussed why it worked as well as it did for some games across all platforms. This year there was a special focus on virtual and augmented reality, featuring people in the game side and the cinematic side of this new technology. One of the highlighted game-track sessions was “building 3-Dimensional UI for Virtual Reality.” Who wouldn’t want to take a look at what’s happening with that? The conference, of course, has its fair share of industry speakers, participating both in summits and giving separate presentations. The Game Developer’s Choice Awards affords members of the community the opportunity to recognize their peers (or be recognized by their peers) for their contributions in the digital game industry. It’s a cool exercise to see industry professionals from all over the world submitting votes for games they think should win awards across 13 categories. You need to register in order to participate in the Game Developer’s Convention. The registration form for 2016 looked like this. The form for 2019 will most likely look very similar. It can be a little pricey, especially if you’re on a student budget, but it’s definitely worth your time to get there at least once. This is pretty much the game developer’s conference. It’s loaded with people from everywhere in the industry, and they’re there to teach you their best practices and discuss all kinds of game design concepts with you. A conference that attracts as many top minds in the field as the GDC does is certainly worth your time and money. While the GDC is arguably the biggest game developers conference, it is by no means the only one. Just take a look over at Gameconfs.com. They keep their homepage updated with all the events happening around the world for the current week. You can also search by country or continent to see what events have already happened this year, and what events you have to look forward to in the coming months. There’s no doubt that you’ve heard of E3. It is probably the most popular expo for gamers, and it’s typically when game studios will make their biggest announcements for upcoming projects and hit titles. From a developer standpoint, E3 isn’t the most beneficial event to attend. This is because of the target audience. It isn’t specifically for game developers, like the GDC is. Instead, it’s really geared towards the end-user and consumer gamers. Of course, if you have the opportunity to attend E3 from a presentation standpoint (i.e. you’ve developed a sweet indie game with your A-team dev pals) then it’s definitely worth attending and presenting (congrats, by the way. That’s awesome!). So many game-oriented events exist, and more are being created all the time. There are many events geared around specific niches or elements of game design. There’s a UX summit, for example. This takes place in North Carolina in May, and deals with user experience in games and apps on the current market. There are other events that don’t deal with game design topics, but instead deal specifically with scripting code with specific programs. C++Now is another conference taking place in May that explores all things C++. Those are two very different events, both occurring within a few weeks of each other. Chances are, there’s a conference or a summit based on what you want to specialize in. Use that game conference search tool to get a feel for all the events out there. These events have some highly experienced game design professionals in attendance. It’s a great way to pick up new techniques and stay on the vanguard of game development. Never stopping your education and growth is like keeping your blade sharp. It’ll give you a real edge in the game developing industry. You never know who you’ll meet or what you’ll learn until you go!